Thimbles, Bobbins, Paper and Ink: Surplus garden bounty? Make Gazpacho! Surplus garden bounty? Make Gazpacho! 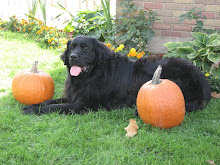 This summer has been excellent for my garden and I will bet for yours too! We've had the heat, the rain, the humidity and now my garden is producing a bounty that is hard to keep up with. But what do you do when you've made all of the pickles you can use, made salsa, sauce, frozen vegetables and have run out of ideas what to put up next in your larder for the winter? I have the answer! 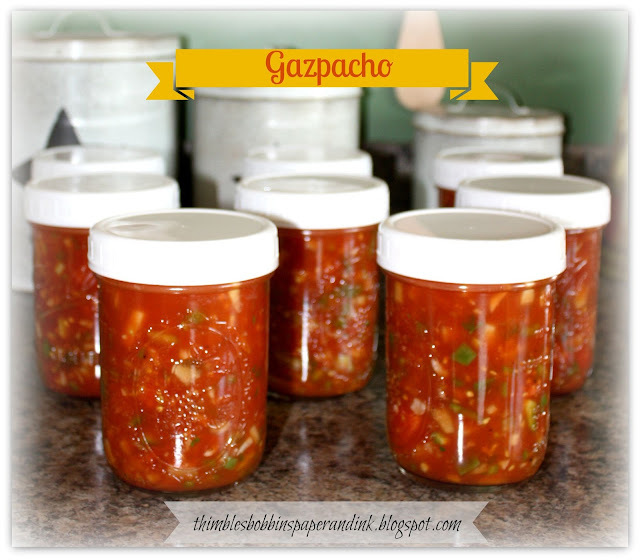 Make Gazpacho! Gazpacho is a soup made of raw vegetables and served cold, usually with a tomato base. Gazpacho originated in the southern Spanish region of Andalusia. And, Gazpacho is the perfect solution to the question, "What do I do with all of these fresh vegetables?". It always seems too, that when you are doing the bulk of your canning and preserving, the temperature soars to the 100+ temperatures...or at least feels like it. 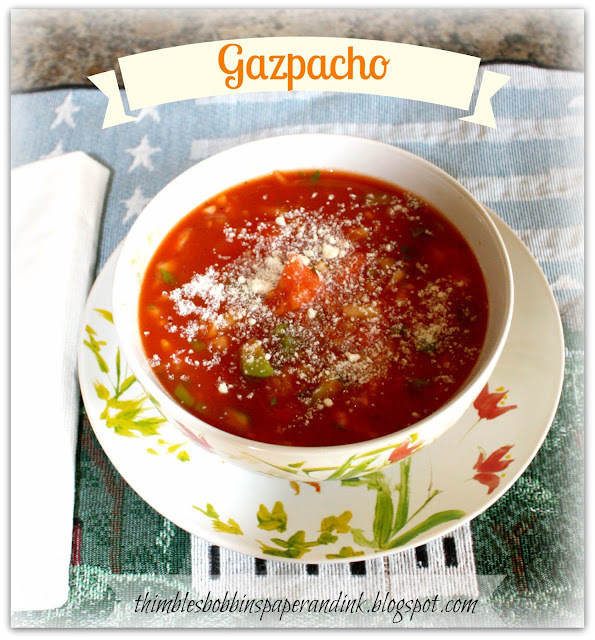 Once again, Gazpacho will bring welcome relief to meal planning because it is a cold, fresh soup that fills you up without heating up the kitchen. COMBINE all ingredient in a large bowl or stock pot. LADLE soup into clean jars leaving 1/2 inch headspace. Place lids and band or plastic storage caps on jars. Twist on lids and label. That's it! That's all you do and you can enjoy your GAZPACHO today and also once the snow begins to fly and you have a craving for fresh vegetables in the winter. All you'll need to do is pull out a jar or two from your freezer and thaw. I LOVE GAZPACHO with a grilled cheese sandwich. That sounds like year round comfort food, doesn't it?